Every company has its own interview process designed to learn more about job candidates. How college students and recent graduates answer questions from an interviewer can make or break their chances of landing entry-level jobs. Recruiters and hiring managers can ask candidates a variety of interview questions during the hiring process. Dennis Theodorou, Executive Search Expert and Vice President of Operations at JMJ Phillip Executive Search, discusses his company’s interview process and offers questions recruiters may ask candidates in general. “December and May are peak hiring times for the majority of employers, and that allows us to hire directly out of several of the top-ranked colleges. In a strong hiring year, well over 100 recent graduates are interviewed, and we’ll hire as many as 10. Some of the top qualities we’re searching for when hiring for any one of our workforce and recruiting companies are listed below. We consider our first interview a fairly easy process; the first round interview focuses more on general knowledge, passions, goals in life, etc., and that allows the job candidate to be less anxious and communicate freely. The second interview, which some have dubbed “the beat down session,” is where we dive into behavioral economics and reasons why people do the things they do. What we’re seeking from college graduates at this point in the interview process is whether or not they will fit into our culture naturally. Interested in learning more about interview questions, go to College Recruiter’s blog and follow us on Facebook, LinkedIn, YouTube, and Twitter. Mr. Dennis Theodorou has more than 15 years of operational excellence and executive experience across multiple industries including: executive search, supply chain, manufacturing, retail and hospitality. Mr. Theodorou graduated with a bachelor’s degree in Supply Chain Management from the leading supply chain management college in the world: Michigan State University. He has continued his education through graduate-level course work at Harvard University. As a development agent for Subway, he managed and led an entire region of store locations including the management of self-owned stores, franchise development, real estate and area management. As a national expert in hiring, he has hired more than 700 employees over his entire career span and works hand-in-hand with companies to help on board top talent. Currently as Vice President of JMJ Phillip, he manages a portfolio of executive recruiting and employment service brands, spanning multiple locations and across nearly all verticals. Trust me, you can do it! Man with a microphone is delivering a motivational speech. Photo courtesy of Shutterstock. 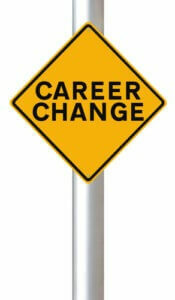 A modified road sign on career change. Photo courtesy of Shutterstock. Making a huge career switch is a tumultuous, exciting and scary time in every job seeker’s life, and with today’s ever-changing economy, it’s very likely that you’ll find yourself making one of these changes at some point during your career. Searching for a fulfilling career is full of ups and downs; it’s a frustrating and exhausting experience that leaves many job seekers in a state of worry and disarray, but in the long-run, finding a new career that fits your goals and ambitions is better than being stuck at a job that you hate.